Core to MVCA’s mission is serving as the statewide voice for Michigan’s growing entrepreneurial and investment community. To advance this objective, MVCA communicates with legislators, the media, and the general public to promote entrepreneurial investment opportunities, challenges, and successes in Michigan. 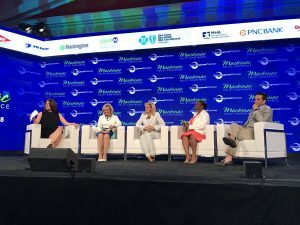 Hosted by the Detroit Regional Chamber, Mackinac Policy Conference is a significant event for MVCA because it provides us the opportunity to connect with influential public officials and share the importance of venture capital to building a robust economy in Michigan. During the conference, we officially met with nearly ten state legislators to discuss the trends from the 2018 MVCA Research Report. But there were plenty of others we touched base with during the conference. Restore confidence in the critical institutions of government, media, and business to trust in society. At the conference, mobility remained a prominent topic of discussion with panels on policy and regulations. We also were able to catch the keynote from Don Butler, Executive Director, Connected Vehicle Platform and Product at Ford Mobility who discussed his vision for the company as a leader in the mobility space. There was also a fantastic discussion on small businesses leading Detroit’s comeback featuring Pamela Lewis of New Economy Initiative (NEI), Wendy Jackson of The Kresge Foundation, and Carla Walker-Miller of Walker-Miller Energy Services. The session focused on how entrepreneurs are driving neighborhood revitalization and wealth in communities of color. Carolyn Cassin of BELLE Michigan Impact Fund also joined Congresswoman Debbie Dingell, La June Montgomery Tabron of W.K. Kellogg Foundation and Ray Teland of PwC for a panel discussion on how businesses across all industries can engage in sustainable practices that create a culture of inclusion and diversity of thought. 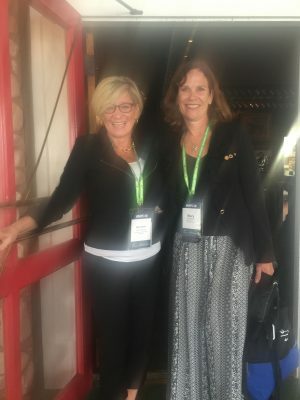 After attending the panels, we met up with our friends from Michigan Business Network for an interview to discuss the highlights from the conference and MVCA’s advocacy efforts on behalf of Michigan’s entrepreneurial and investment community. We then attended the annual Muchmore, Harrington, Smalley & Associates (MHSA) reception at Mary’s Bistro and had back-to-back meetings with state legislators thanks to MVCA’s legislative advocacy team at MHSA. Lobbyist Evie Sweeney provided great connections and lined up meetings with state legislators for our advocacy efforts! These meetings are critical because they allow us to have a one-on-one discussion about our top advocacy initiative – increasing the amount of capital and talent available to venture and angel investors so we can fund Michigan’s most innovative entrepreneurs. We met with Rep. Scott VanSingel, Rep. Christine Greig, Rep. Julie Alexander, Rep. Mary Whiteford, Rep. Jon Hoadley, Rep. Kevin Hertel, and Rep. Donna Lasinski. During our discussions with representatives, we shared the importance of venture capital and how funding Michigan’s entrepreneurs is a significant economic driver for the state. 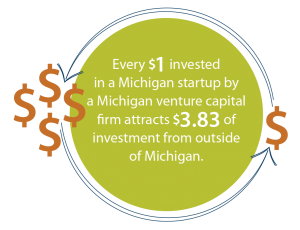 In fact, every dollar invested in a Michigan startup by a Michigan venture capital firm attracts $3.83 of investment from outside of Michigan based on the findings from the 2018 MVCA Research Report. Approximately $627 million of additional venture capital will be required in the next two years to adequately fund the growth of Michigan’s 134 venture-backed startups. However, there is $403 million of venture capital available for existing portfolio companies – highlighting the need to increase the amount of capital available to support Michigan’s entrepreneurs. Legislators were highly interested in our message and understood the significant role Michigan’s investment community plays in stimulating greater economic growth in the state. By building these relationships, we can continue to make headway in growing a robust entrepreneurial and investment community.